Parking is the land use growing at the fastest rate. Most real estate projects in the city provide an amount of parking close to the legal requirement. There is no relation between the amount of parking built and the distance to a mass transit station, since the minimum is the same citywide and developers provide as close to the minimum as possible. Based on data on parking in 251 real estate projects from 2009 to 2013, Part I ended with the phrase “this suggests that developers want to provide less parking than they are required to”. In other words: this suggests that demand for parking is lower than the minimum requirement. Look at Figure 1 below. By making it illegal to build less parking than the minimum, the law makes it impossible for us to see all of what could be happening below that value (on the left side). Imagine that the minimum is abolished. The distribution above should converge to a normal distribution with a shape that resembles a bell (Gaussian bell). The highest point of the bell is the expected value of the variable, in this case the market demand for parking. If this is true the bell curve would have a similar shape to the figure above, where the highest point is exactly where the minimum is. So, the data shown does not automatically refute this possibility. But is it really plausible? We know that the regulation is 30 years old. And it was created using the usual “rigorous” process of copying other cities’ parking requirements. Is it possible that by an amazing coincidence, the regulation had the good fortune of precisely predicting parking demand 30 years later? If so, the planners may deserve a Nobel Prize in Economics for predicting the demand for parking so well three decades in advance. That seems an improbable coincidence of too many factors. We can easily reject this possibility with the following argument. The only limitations on building more parking than the amount required are the market and the physical and financial realities of each site. There are no legal impediments to providing more parking, such as parking maximums and/or parking caps per zone. The amount of parking is only limited by the budget and expected profit of the project. 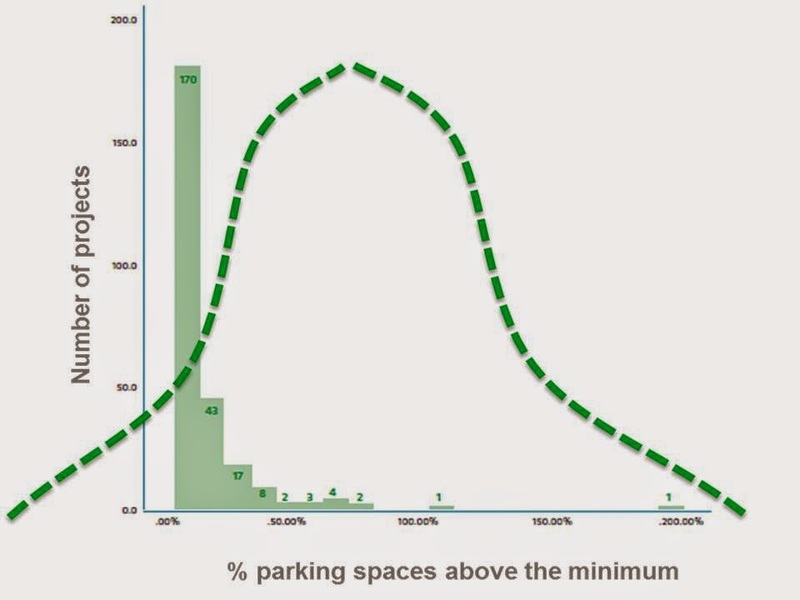 So if this possibility is true and the demand for parking is significantly higher than the minimum, then we would expect the highest point of the bell to be further to the right on our graph (as shown in Figure 2 below). Clearly, the data on parking supply is not consistent with possibility #2. We are left with this third possibility. The minimum parking requirement must exceed the demand for parking. The peak of the bell curve is probably well below the current minimum. In the absence of the parking minimum, many projects would build less parking. Retail is the lonely exception to the comments above. 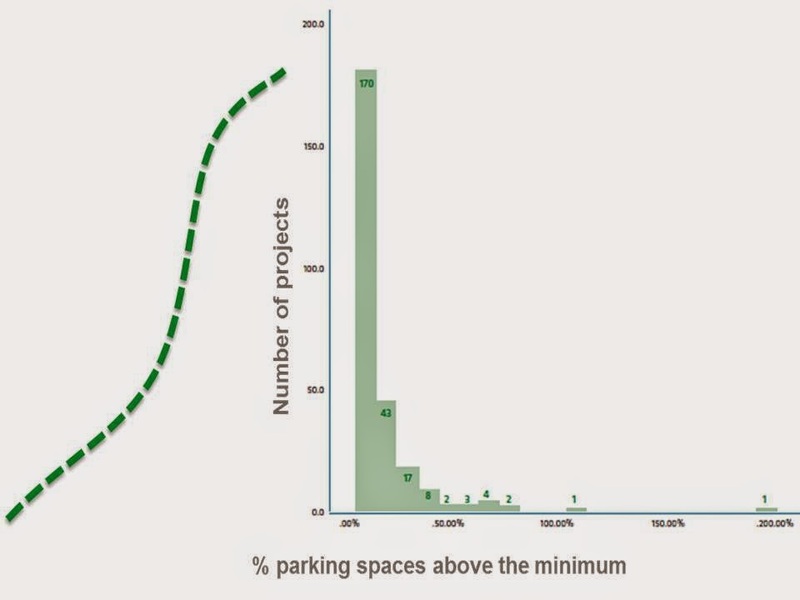 Retail has a significantly higher observed percentage of parking spaces above the minimum compared with the rest of the projects in the study (see Figure 3 below). Retail (big-box) projects added 22.4% more parking than required on average, while in general it was 10.4%. 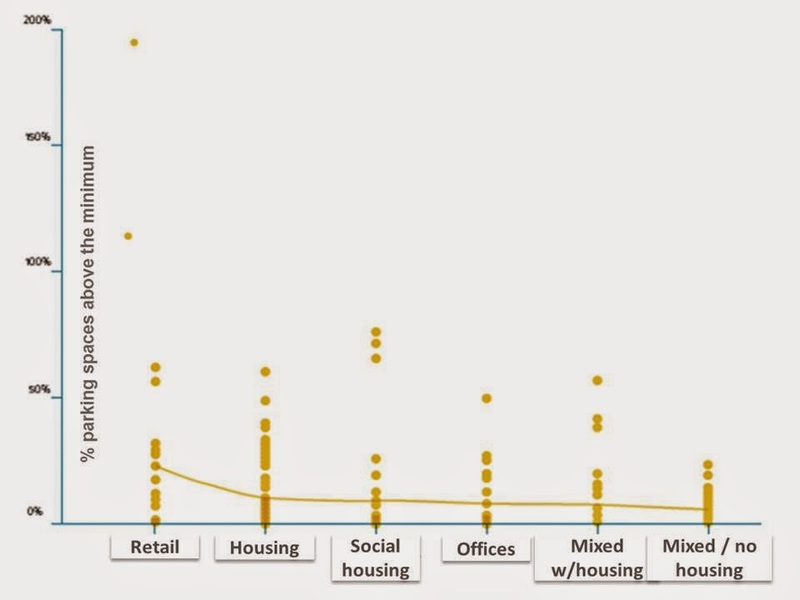 Mixed use developments provided 7.6% above the minimum when housing was part of the equation and 5.6% when there was no housing in the mixed use development. It seems that retail construction is the only case with a strong desire to provide more parking than required by the regulation. These projects are malls, characterized by their automobile oriented design that requires large sites. However, less parking is built when retail has a smaller scale (human oriented design) and when it forms part of a mixed use development. Large retails seeks to provide enough parking for peak demand days of the year (such as the Christmas season) amounting to no more than 30 days of the year, even if it stays underutilized the rest of the calendar. Retail developments in Mexico City gain revenue from priced parking in the retail parking garages. It is also said that anchor stores require 50 to 100% more spots than the law as a condition to their leasing contracts in some areas. Extra parking helps us to understand why retail projects use a lower percentage of their zoning rights than the rest. Retail projects develop only 68.8% of their rights on average, when the overall average is 81.9%. Financial, land, underground and space resources in a project that are devoted to parking cannot be used for the primary use of the site. Minimum parking requirements that exceed parking demand impose additional costs on development. This undermines density and increases the living expenses of the whole population, car owners or not. This amounts to a subsidy for driving in the form of cheap ample parking that will bring more congestion in the future. Contrary to the claimed rationale, required parking in no way mitigates the urban impacts of real estate development. Instead of excessive parking minimums, the city should encourage new urban instruments such as parking maximums and taxes to capture some of the money invested in parking and redirect it to better transit, cyclist and pedestrian infrastructure. For example, 1.2 million square meters of new offices are expected in the city within the next 3 years. Under the regulation (1 parking space for every 30 square meters), 40,000 new parking spaces are mandated with a conservatively estimated construction cost of 500 million USD. Is it a “social benefit” to encourage 40,000 more cars to commute every day through the principal corridors of the city? With that money the city could build 70 km of Bus Rapid Transit (BRT) and move more than 600,000 commuters instead of 40,000. Or we could add 50 km of complete streets (with BRT included), 140,000 publicly shared bikes, more than 8 million square meters of high quality sidewalks or more than 1,000 km of cycle lanes. Such options, not mandated parking, would provide true mitigation of real estate development. ITDP will soon publish the English version of the report Menos Cajones, Más Ciudad (Less Parking, More City).